Sacrificing Riley Rodriguez’s life like a pawn on a chessboard, Andrew S. Malcolm escaped a conviction. Now his father, rival drug lord Pablo Rodriguez, has kidnapped three persons of interest, hoping to draw out Prince Andre “Dre” Malcolm. Lacking faith in their aging father's lenient methods, his two most capable sons took matters into their own hands--and failed. Now it's up to his 'lesser' sons: the handsome, nonchalant, mild-bipolar and closeted bisexual Jose Rodriguez- who’s secretly in love with Dre- and his wise, openly gay activist brother and outcast, Santiago Rodriguez. Blinded by an insatiable lust for power and willingness to double-cross everyone to take over the family, Justin Malcolm rises. But heavy is the head that wears the crown. Donte Malcolm finds himself grappling the unreality of going from riches to rags for defying his family. He is consumed with guilt when his transgender lover, Hazel Peterson, is kidnapped. To return to power, he would have to betray his relatives...but is power what he truly wants? Dre and Justin struggle for power, but when Dre's husband Jevaughn arrives in Miami and learns of Dre’s actions in the name of family honor, it strikes a deadly blow to their marriage. Bonds will be broken and hearts will be tested. -- I sat miserably in my seat, gazing at him with loathing the past three hours, occasionally retreating to the bathroom to wash my face. As if the cool water could calm my temperature, but it did. The short distance away from him made all the difference in the world, because I wasn’t only mad as hell, I was hurt. Kriss was here. He’d been invited by the old white guy Santiago identified as Maxwell Stone, Chairman of the foundation, seventy-one years old and openly gay. Kriss sat beside him in all his glory, in his two thousand, seven hundred dollar black Givenchy tuxedo and his nine hundred dollar brown shoes. He did say he was attending a party, didn’t he? And if I was thinking clearly, which party would require him to dress so posh? Never, in my wildest daydreams, could I have imagined I would stumble into him here. Despite our intimate relationship, I’d taken comfort in Florida’s size to keep us from ever meeting outside of our secret escapades. I always imagined him in another world; one that nested in my closet. Now that I saw him here, knowing who invited him, knowing who he was probably messing around with, it just knocked me over the edge. Kriss had looked into my eyes only last night, begging desperately for forgiveness, telling me how much he wanted me and me alone and was ready to take my brother’s advice and change his life around. He’d never mentioned this hot date with a rich old man. The betrayal was burning me alive. I glanced over at him, and my face twisted into a hard and bitter mask. To push me further over the edge, he just smiled, gloating with success, as if saying, I made it. Father was furious that I was attending any event where Santiago would be honored for his work in activism. He slurred discriminatory remarks at us, even though I underlined that Priscilla was my date. If I had only stayed home, I wouldn’t have been here, feeling like this. I noticed that stress just pushed me over the edge, and everyone else noticed, too. Big bro warned me not to let stress get the best of me. But how could I just overlook something like this, such a monstrous hurt? What gets you started on a story? Personal experiences or fantasies also slip their way onto the pages now and then, but it’s the characters that get me started 8 times out of 10. In any given moment I pay attention to how I’m feeling, and I try to revel in that feeling whether good or bad and that’s how I can hear the characters in my head, creating scenes and scenarios that I always seem to be able to put together perfectly, and this is exactly how the new characters in my latest book: “The Malcolm mafia & the Rodriguez Cartel” were created. By feeling and listening to the characters. How do you connect to readers emotions? I like this question, it’s just perfect because as I said, its exactly the same way how I create characters, I let the characters create themselves, choose what they want to go through and then it’s my job to masterfully tie it into the main theme of my work in progress. For example, in “The Malcolm mafia & the Rodriguez Cartel”, characters José and Santiago are brothers from a very powerful family but always sort of treated as outcast by their father due to their personal issues. José is mild-bipolar and schizophrenic, while his brother Santiago, came out to his father in his late teens as not only being gay, but also that he contracted HIV, and the father, the very homophobic cur ran him out of the family home. Fast forward years later, the father Pablo lost the sons he was hoping to take over the family and now must depend on preferable José, who in turn will take over only if Pablo once again accepts Santiago, who has gone on to becoming an iconic, successful and Award winning LGBTQ Activist. These characters came to me broken, flawed, damaged and wanted their stories told, and told in a way that it grips readers, but in the end, things seemed to work out alright, and how it works out is something readers must find out for themselves by reading the book. So basically, I connect to reader’s emotions perfectly by creating a story that is character-driven. Real people with real issues someone, somewhere can relate to in one way or another. Which character have you created that you can relate to on a deep interpersonal level? That would be Jevaughn. 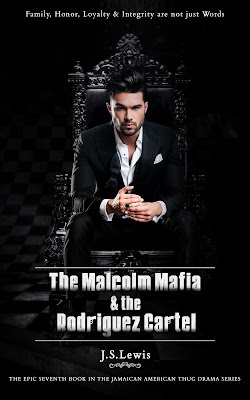 He narrates about 9 chapters in “The Malcolm Mafia & the Rodriguez Cartel”, and is the main character. He and I share a symbiotic relationship. J. S. Lewis lives in Kingston, on the beautiful, sunny Caribbean island of Jamaica. The inspiration to write struck him during his last year of high school. Narrowly escaping a gay bashing, J.S. sought comfort and freedom in the world of writing. However, Jamaica had not yet matured out of homophobia, and there was no way of getting M/M romance into local publishers' hands. Out of place in corporate Jamaica, his seductive, spicy dramas have found a loving and enthusiastic home online. An army of supportive fans and generous family have helped him accomplish his dreams and share them with readers across the world. He can't wait to bring you the next installment in the LGBTQ and gangster saga. Readers who love the shows Empire and Atlanta will love the next installments in the series. I was drawn into this story and haven't escaped yet. I experienced all emotions while reading this unbelievably awesome book. I cried and cried and cried some more. Tears of sadness, frustration and joy. J. S. Lewis is amazed me with his incredible writing.